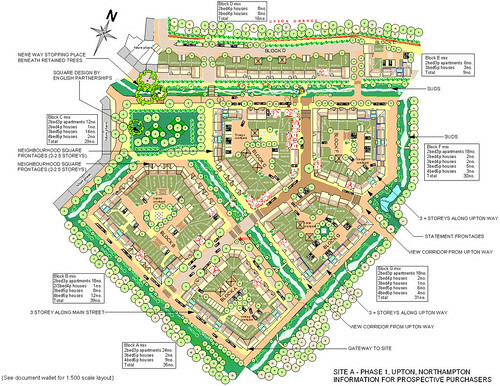 The brief for this first phase of the new urban village at Upton Northamptonshire called for a high density mixed use urban quarter combining flats, townhouses and bungalows within a clear hierarchy of urban spaces. The layout combines main street frontages with winding lanes and mews, consistent with the local village vernacular and carefully sited landmark buildings to provide edge identity to the village. 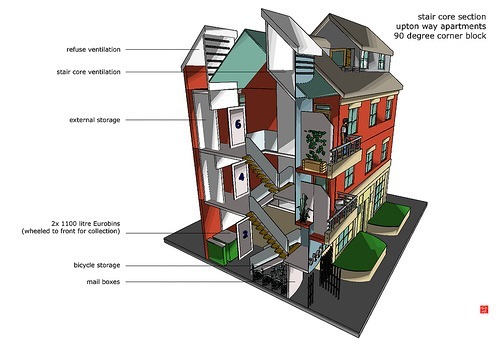 An extensive sustainability agenda called for energy efficient houses combined with a layout responding to passive solar criteria maximising sunlight and minimising overshadowing. The entire village project will feature a SUDS including balancing ponds and streets lined with swales. Our submission sought to maximise such features as part of the leisure and play strategy on this phase. The elevational treatment of the buildings drew from both the rural and industrial heritage of the county, combining a variety of window styles and masonry finishes to suit the grandeur of main street and the informality of the back lanes. The Axis submission was made in partnership with Lovell Partnership Ltd.